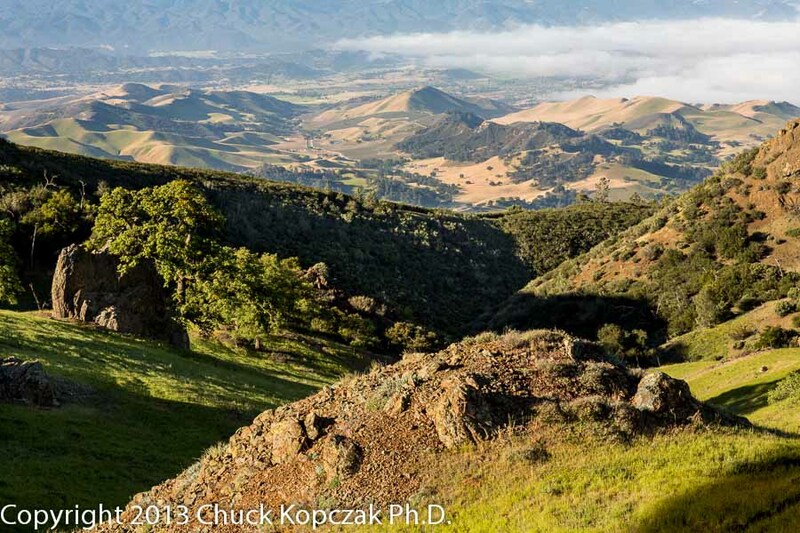 Looking down from the flanks of Figueroa Mountain into the Santa Ynez Valley below. Fog from the Pacific Ocean has reached its inland limit. The Santa Ynez Valley north of Santa Barbara, California, is a reminder of what much of the urbanized areas of California may have looked like historically - rolling oak woodlands with interspersed grasslands covering the hills and valleys. The view above was taken from the vantage point of Figueroa Mountain overlooking the eastern end of the valley. The eastern extent of the previous night's marine layer of fog can be seen in the upper right of the image. It is this cooling marine influence that makes this part of California ideal for grape production and wine making. And while bucolic images of farms in the countryside evoke a well-known image of nature, agriculture, in fact, often destroys the natural ecosystems that once occupied an area and replaces it with a man-made system that may or may not be compatible with conditions found in the area. This is not to say that agriculture is evil or should be denigrated. Rather, we must keep in mind that changes we make to the Earth's ecosystems can have far-reaching consequences, many of which are unintended, and may be irreversible by any simple means. This photo was take with a Canon EOS 5D MkIII and an EF 85 mm lens. Shutter speed was 1/500 sec at f/16 and ISO 800.